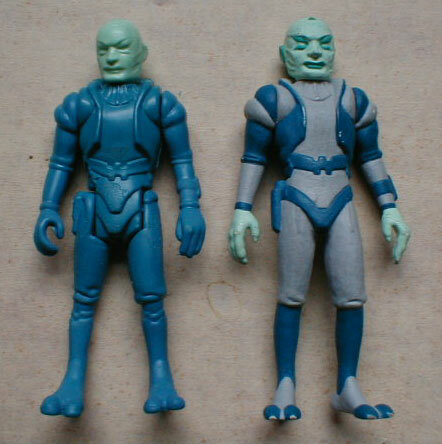 This photo shows two very different prototypes of the Tig Fromm figure from Kenner's 1985 Droids line. On the left of is a first shot. Although it is unpainted and lacks copyright markings, it is basically an injectio molded figure, just like the ones released to stores. On the right, however, is an early hardcopy of the figure. I say it's early because it's detailing is different in several respects from that of the production figure. This is most evident around the area of the waist, where the hardcopy can be seen to lack a ridge evident on the first shot, as well as at the knees and hands. Although it's hard to tell from the photo, the hands of the hardcopy have finger nails, while those of the first shot do not. The most unique feature of the hardcopy, however, occurs at the joints of its legs. Actually, there are no leg joints-- the legs are connected to the torso and immobile. This indicates that this hardcopy was created from an early, perhaps still partly conceptual, sculpting.